Breakfast served 7 a.m. - 10 a.m. Lunch: Grilled Sanwiches served 10:30 a.m. - 3 p.m.
Signature & Classic Sandwiches served 10:30 a.m. - 4 p.m.
Breakfast served 7 a.m. - 2 p.m. 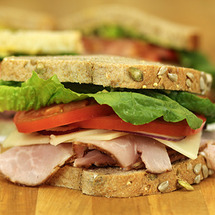 Lunch: Grilled Sandwiches served 10 a.m. - 2 p.m.
Signature & Classic Sandwiches served 7 a.m. - 3 p.m. Minimum of 7 sandwich order for delivery. For large orders please place at least 24 hours in advance. 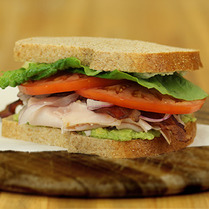 Click on the link below to view our full sandwich menu. Fresh avocado, romaine lettuce, tomato, smoked turkey breast and crispy bacon with bleu cheese spread on Honey Wheat Bread. 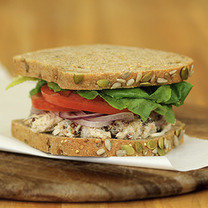 Chunks of white and dark chicken in a seasoned mayonnaise dressing with spicy pecans on your choice of bread. Freshly sliced deli ham piled high, topped with Swiss cheese on your choice of bread.